Case3) Ex employees. I once met an Ex Telefunken Employee on an electronics flee market in Germany, selling small quantities of NOS tubes for attractive prices. The typical friendly old man on those flea markets, just the normal picture. So I payed not much attention to him, I just bought some of his tubes. Then after testing them, I was surprised by the good quality. This was finest NOS. I had his business card, and I went to visit him. Some unknown miniature company it seemed to me. It was just this one person doing this business on his own. A very intelligent and knowledgeable person, very old fashioned, no website, and no Ebay. Then from his private house, he took me to his warehouse. It was one of the largest NOS warehouses I ever saw. Only problem, it was all radio stuff, and very little Audiophile tubes. Though I could nicely pick out some audiophile tubes, it was not too many. After we gained more contact, over time, he showed me something else. It was his fakery shop. Simply in his private house in Germany, near by the ex-Telefunken factory. I am telling this now, as he closed down all business as after being diagnosed with a serious disease. So he gave up working suddenly. In the basement of his private house, was a little room, in there was an old electric Telefunken tube printing machine and tons of NOS boxes that he saved from destruction when he still worked there. I have some pictures of it. The old man was now retired, but working in this little room every day, faking tubes by hand. 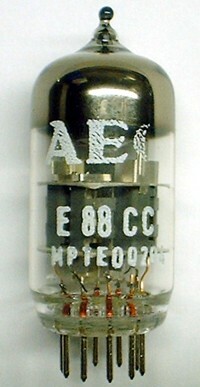 He would order Russian tubes from other tubes companies in Germany, and re-print them Telefunken or AEG. Also doing fake jobs for tube dealers, re branding tubes. This was an interesting thing I saw there, he had 6V6 tubes that were re branded decades of years ago for some company, and he was re branding them back to the ORIGINAL brand. Crazy situation. He had precision metal logo stamps, that fit in his Telefunken machine, and original boxes, in many shapes and sizes. He could fake approximately 100 tubes per day. His re-branding tools were sold to a person in Munich in 2013. And I think he did not buy those for a tube museum.